It’s officially back-to-school season and it can be both exciting and nerve racking. With another new school year of challenges and successes ahead we want to send you off to school with a great back-to-school project! Which is why we created the Open Wide Pencil Case made with Joyful Fusions fabric made by AGF. 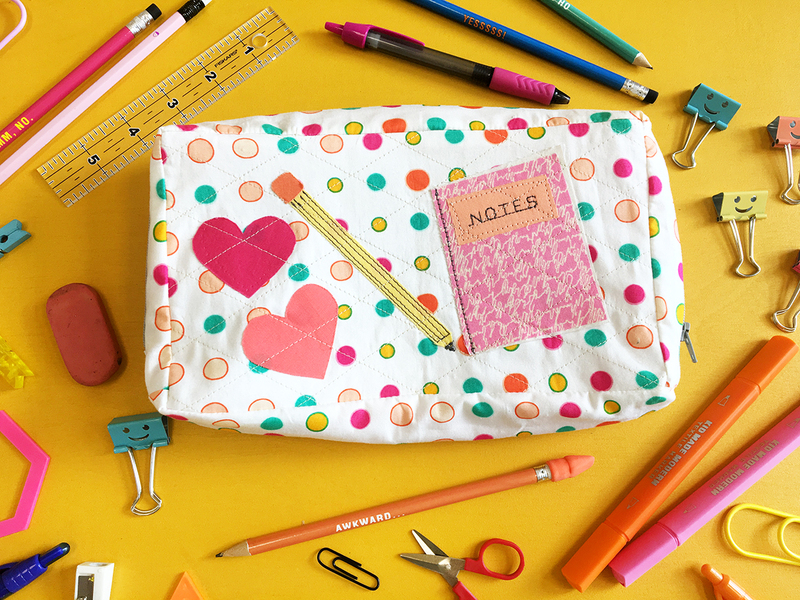 This collection has fun fabric perfect for making trendy cute pencil bags. We love the appliqué in the front of the bag, it makes going to school more fun when you have the right accessories to store all your supplies. Don’t think you need to be going back to school to make one for yourself! Everyone needs a nice pencil case to store all their goodies. 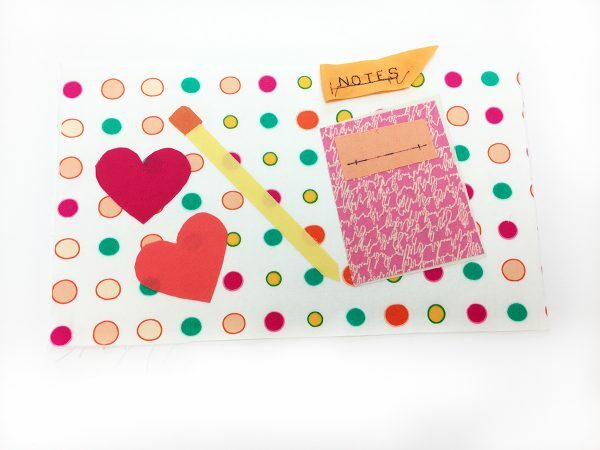 This project makes a super sweet and thoughtful gift as well. Fabrics D through H use scrap pieces of fabric that fit the pencil bag templates. Make sure to Download the TEMPLATES! 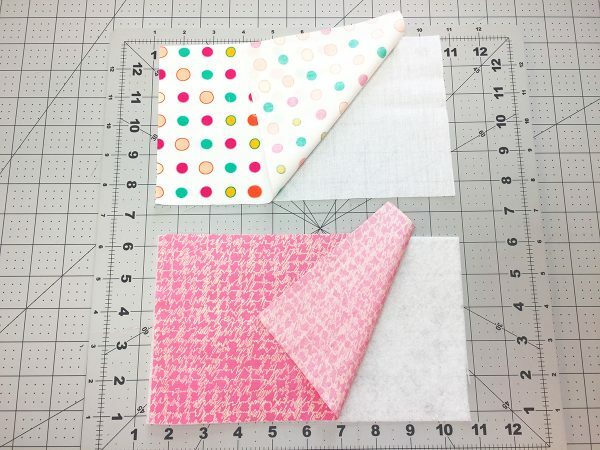 Take your exterior pieces from Fabric A and attach the lightweight fusible. Next, take your interior pieces from Fabric B and attach your medium weight fusible. 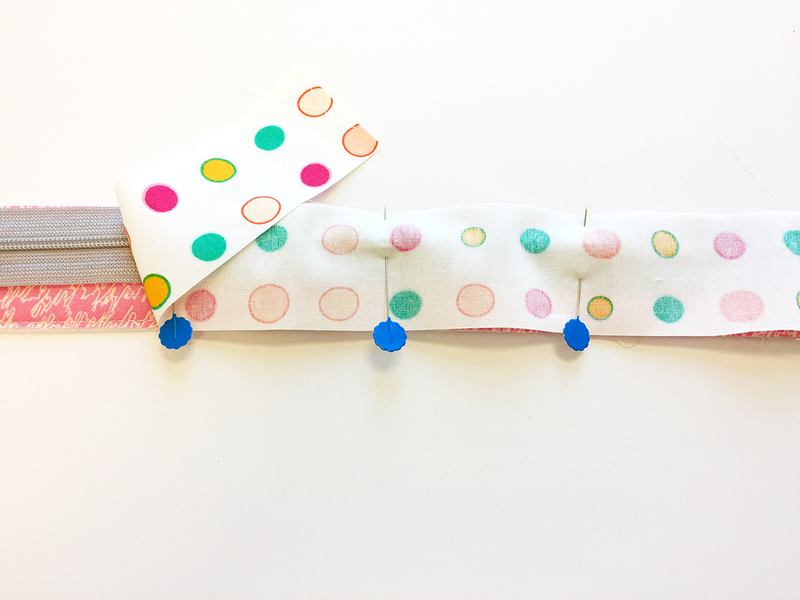 Take your 1 1/2″ x 20″ strips from Fabric A and attach your light weight fusible. 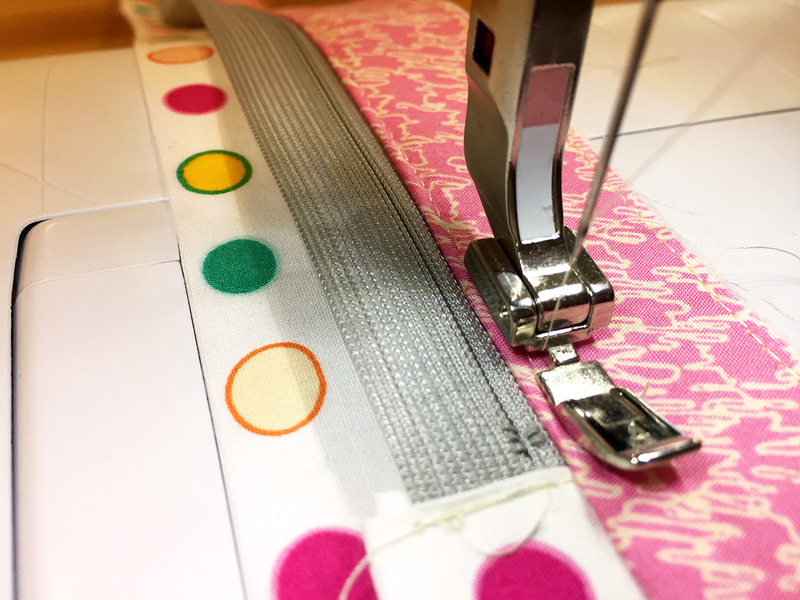 Attach your medium weight fusible to the 1 1/2″ x 20″ strips from Fabric B. Repeat this same process with your 1 3/4″ x 10 1/2″ bottom pieces. 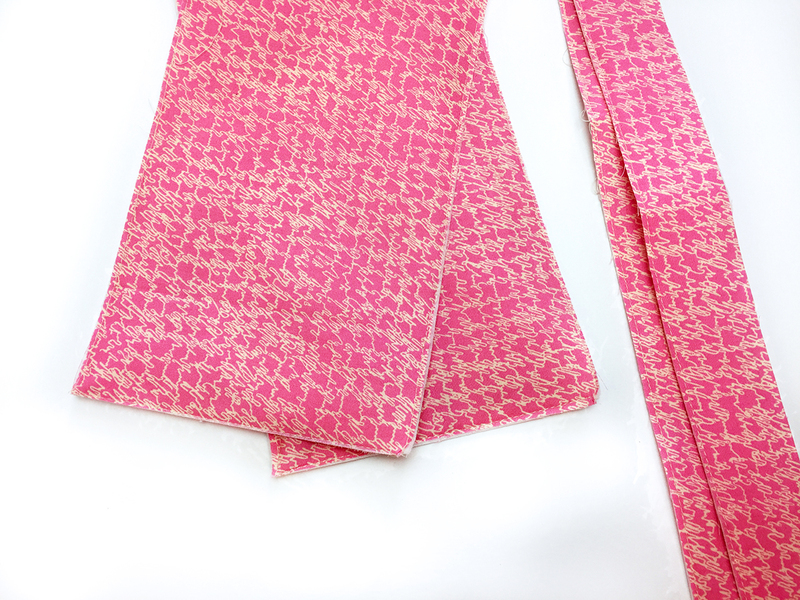 Apply Steam-A-Seam to the back of the fabrics you will be using to cut out your templates. Trace your template onto your fabric with a fabric marking pen and cut out design. Arrange your pieces on your front pencil bag and press into place. Stitch your appliqué down and quilt as desired. We did some diagonal straight line stitching for some fun detail. We stitched lines in the pencil to make it come to life and added letters on the notebook using BERNINA’s letters and numbers feature. Make sure to quilt the back piece as well. 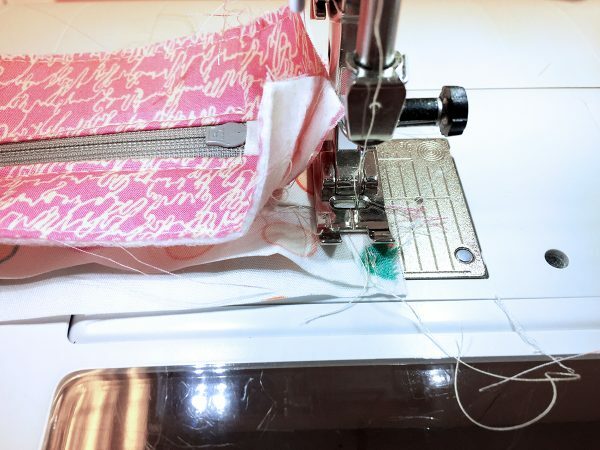 Tip: Test out your letters on a scrap piece of fabric to measure how long the word will be and to help with placement on your project. Take your 1 1/2″ x 4 1/2″ rectangles and press raw edges to the center and then fold in half and press. 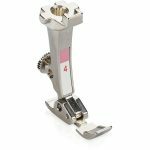 Encase your zipper ends and stitch as close to the edge using Zipper foot #4 to secure zipper ends. Place 1 1/2″ x 20″ strip from Fabric B with the right side of the fabric facing you. 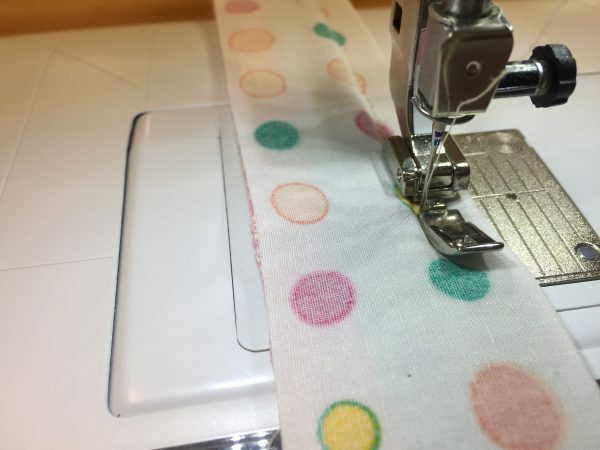 Place the right side of the zipper up on top of Fabric B and then place a 1 1/2″ x 20″ strip from Fabric A with right side of the fabric facing down. Sandwich the zipper between the fabrics and pin in place. with needle in the down position and lift presser foot. 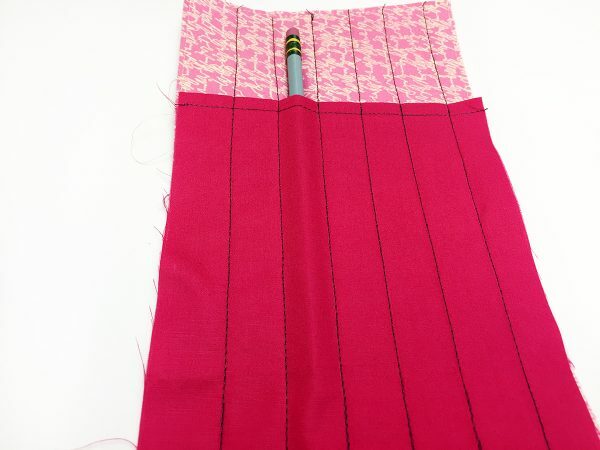 Pull zipper shut and out of the way and keep sewing to the end of your zipper. Repeat this same process to sew the other side of your zipper. Topstitch the lining of your zipper down to make sure that the lining will not get in the way of your zipper when opening and closing your bag. 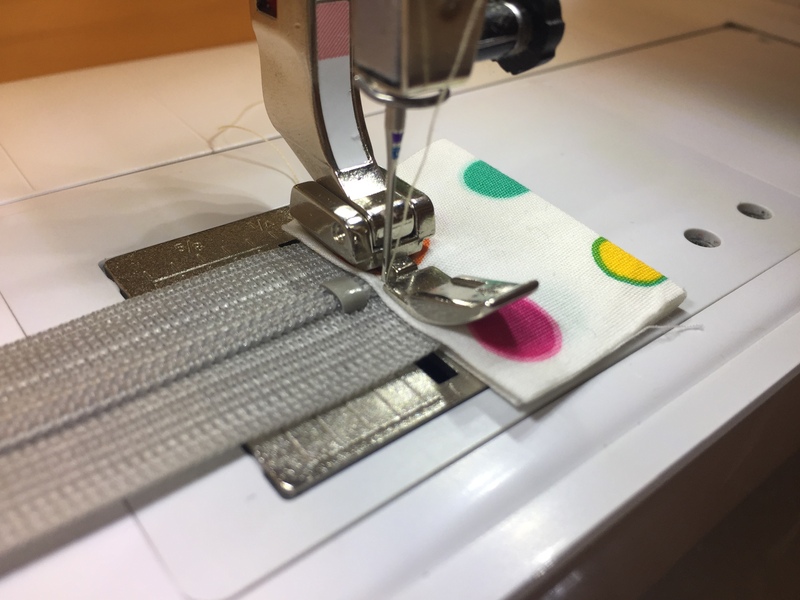 Pick open a few stitches to separate the ends of Fabric A and B on each side of your zipper enough to be able to sew your bottom strips at 1/4″ seam allowance. Start by attaching your bottom piece from Fabric A, making sure your sewing with fabrics right side together. did to sew the exterior. You should get a complete circle side panel piece that is perfectly finished with the seams hiding on the inside of the piece. 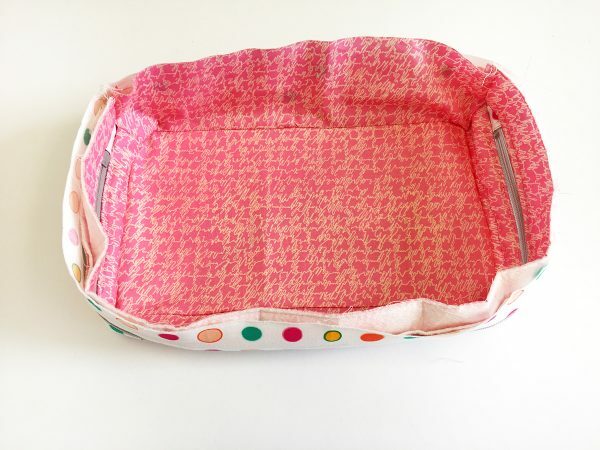 Fold your 5 1/2″ x 13 1/2″ rectangle from Fabric C in half and sew 1/4″ topstitch on the folded edge. Place on one of your 5 1/2″ x 9 1/2″ interior pieces from Fabric B.
Pin into place and draw lines 3/4″ apart with a fabric marking pen. Stitch on the lines you drew to create your pencil dividers. 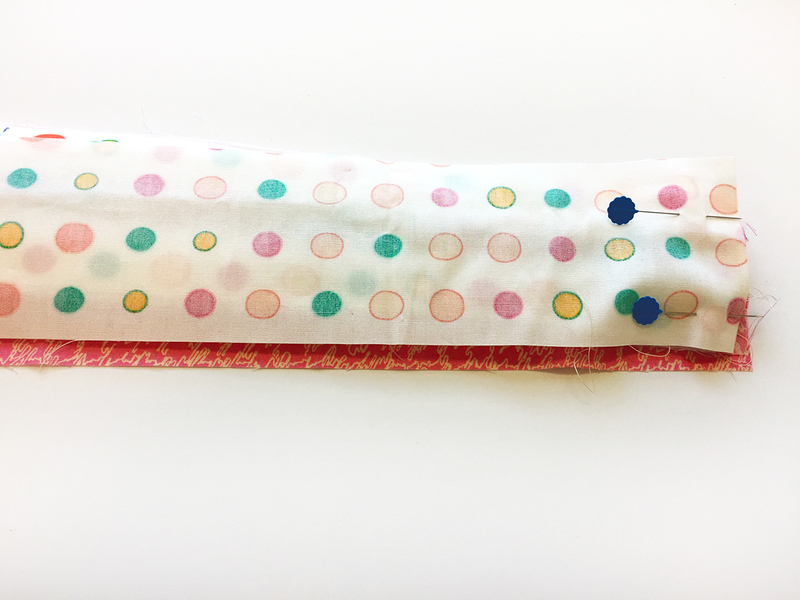 Pin your front bag to the outer zipper fabric (Fabric A) and sew all the way around. 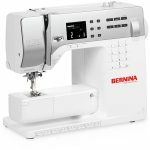 Next sew your interior in the same manner. Repeat this process with the other exterior piece making sure zipper is unzipped. The last piece to sew is the last interior piece. Make sure to leave a small unsewn portion to flip project through. Flip project through and hand stitch opening shut! 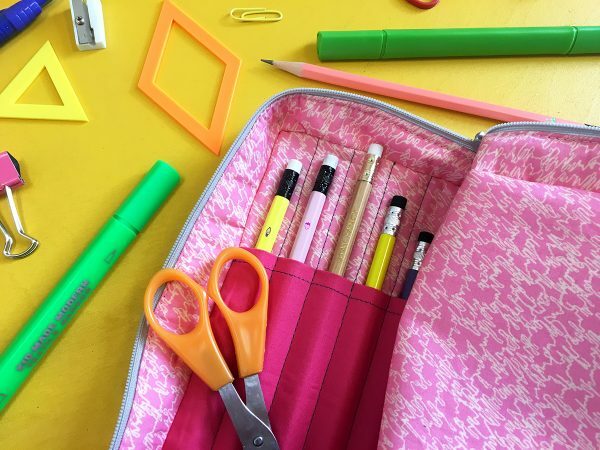 Have fun filling your pencil bag with all your favorite pencils and supplies. This is super cute! But I am having trouble understanding Steps 6 thru to the end. How does the pencil holder part get sewn in? Thank you. Hi !Thank you so much! Let’s see if I can help. 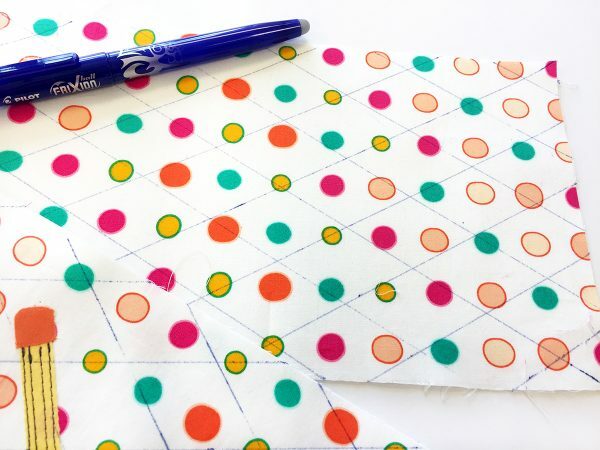 To attach the pencil divider place your folded 5 1/2″ x 13 1/2″ rectangle from Fabric C on top of your 5 1/2″ x 9 1/2″ rectangle interior piece from Fabric B and stitch lines about 3/4″ apart (big enough to fit your pencils). To attach all the 5 1/2″ x 9 1/2″ rectangles from Fabric A and B (the interior and exterior pieces) I first started with the front of my pencil bag to the outer zipper layer, all the way around. I repeated this step by sewing the front interior layer. Making sure right sides are always together. 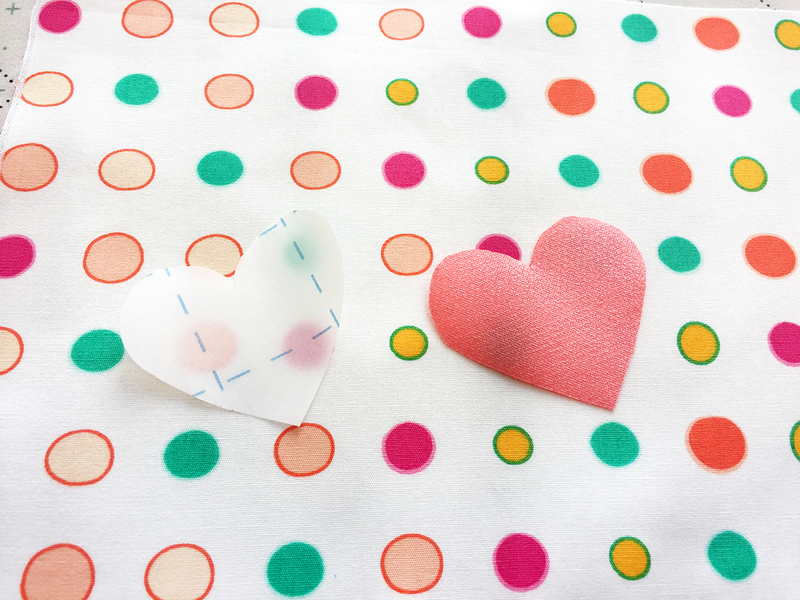 Make sure to use a lot of pins and pull them out as you sew. Then to sew the other two interior and exterior pieces it gets a lil tricky. But I found it easier to do this by having the zipper open. 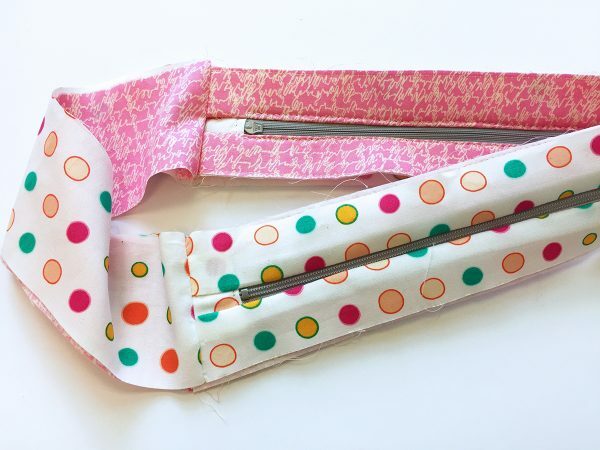 You have to maneuver your pencil bag around turning it inside out to be able to pin your 5 1/2″ x 9 1/2″ rectangle interior and exterior pieces all the way around your zipper piece. 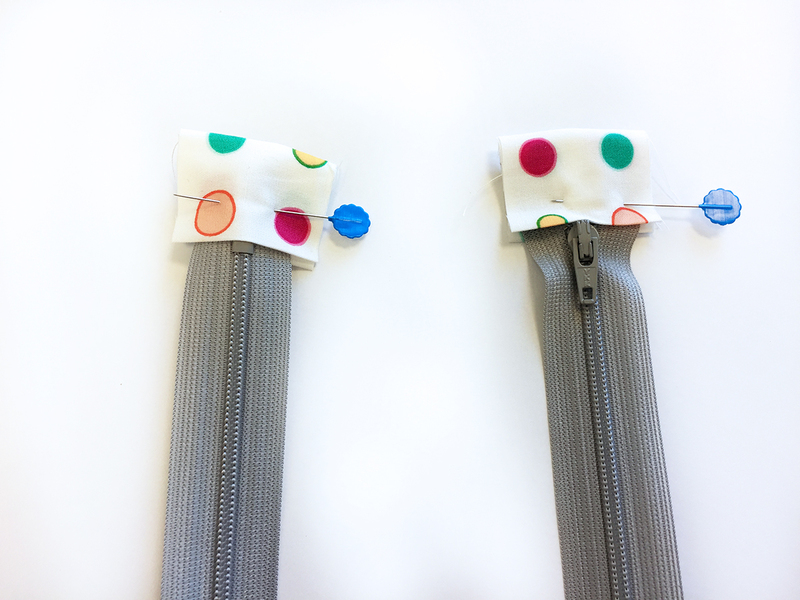 The last step is to attach the interior with the pencil holder attached to it to your inside zipper piece. Turn your bag inside out pin and sew all the way around leaving a hole big enough to where you would be comfortable turning the bag right side out. Then you can hand sew the hole shut. 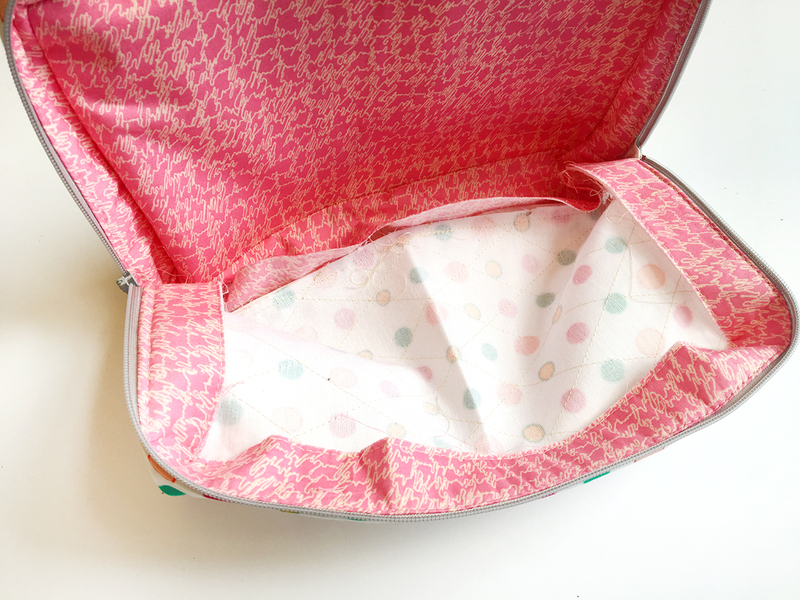 I loved the way the bag turned out because the insides of your bag is completely lined and no raw edges are seen and using this method you don’t have to worry about binding any exposed seams! Once you have mastered it will be very rewarding and you can incorporate this into all your bag making. Keep working on it and let me know if you have any questions and I will try to help the best I can!